N. maxima X veitchii "select"
Nepenthes maxima X N. veitchii is a hybrid between two highlanders. I grow it outdoors in full sun and it has done fine for me. It did get some initial leaf burn at first because I gave it too much direct sun adapting it to my outdoor conditions. However, the plants bounced back and are doing great. For me, this hybrid seems to be a slow grower similar to N. veitchii. The N. maxima X veitchii "select" is from Exotica Plants cuttings that they offer periodically. I call it "select" because it is one of their especially nice clones that they've held back. These clones tend to be more expensive, but then they are more exceptional. Faster growth may happen in slightly warmer climates as I feel this hybrid would grow a little faster in intermediate temperatures as opposed to highland. 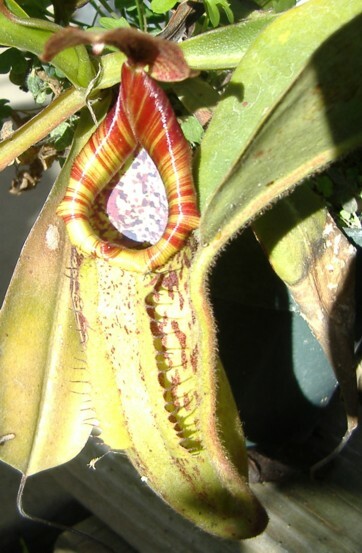 As this plant gets larger, basals may be produced similar to N. veitchii more regularly than a typical vining Nepenthes.